This map shows in which European areas artifacts from the Upper Paleolithic period were found. Upper Paleolithic Venus figurine-like fertility image. The Upper Palaeolithic (Upper Paleolithic or Late Stone Age) is the third and last part of the Palaeolithic period. It lasted from about 40,000 to 10,000 years ago. Humans used tools for hunting and fishing. They also developed cave paintings. In this period, the Neanderthal man completely disappeared, leaving Homo sapiens as the only surviving species in the human genus. In Europe, Asia and Africa, this time is known as the last part of the Old Stone Age. The first modern humans found in Western Europe date back to about 36,000 years ago. Those fossils were found in the south-west of Romania. The founds were made in a stone cave called Peștera cu Oase. The Lascaux cave paintings are from this time period. They are part of the UNESCO World Heritage Sites since 1979 and are in France. Evidence for belief in the afterlife in the Upper Palaeolithic: appearance of burial rituals and ancestor worship. Possibly among the earliest traces of art are Venus figurines. These are figurines (very small statues) of women, mostly pregnant with visible breasts. The figurines were found in areas of Western Europe to Siberia. Most are between 20,000 and 30,000 years old. Two figurines have been found that are much older: the Venus of Tan-Tan, dated to 300,000 to 500,000 years ago was found in Morocco. The Venus of Berekhat Ram was found on the Golan Heights. It has been dated to 200,000 to 300,000 years ago. It may be the one of the earliest things that show the human form. Different kinds of stone, bones and ivory were used to make the figurines. Some are also made of clay which was then burned in a fire. This is one of the earliest known traces of the use of ceramics. They may be representations of human fertility, or they may have been made to help it. They may represent (fertility) goddesses. Scientists have excluded that these figurines were linked to the fertility of fields, because agriculture had not been discovered at the time the figurines were made. The two figurines that are older may have mostly formed by natural processes. The Venus of Tan-Tan was covered with a substance that could have been some kind of paint. The substance contained traces of iron and manganese. The figurine of Berekhat Ram shows traces that someone worked on it with a tool. A study done in 1997 states that these traces could not have been left by nature alone. 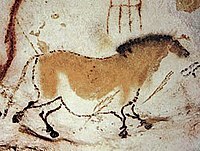 Cave paintings are paintings that were made on the walls or roofs of caves. Many cave paintings belong to the Palaeolothic Age, and date from about 15,000 to 30,000 years ago. Among the most famous are those in the caves of Altamira in Spain and Lascaux in France.p545 There are about 350 caves in Europe where cave paintings have been found. Usually, animals have been painted, like aurochs, bisons or horses. Why these paintings were done is not known. They are not simply decorations of places where people lived. The caves they were found in usually do not show signs that someone lived in them. One of the oldest caves is that of Chauvet in France. Paintings in the cave fall into two groups. One has been dated to around 30,000 to 33,000 years ago, the other to 26,000 or 27,000 years ago.p546 The oldest known cave paintings, based on radiocarbon dating of "black from drawings, from torch marks and from the floors". As of 1999, the dates of 31 samples from the cave have been reported. The oldest paintings have been dated from 32,900±490 years ago. Some archaeologists have questioned the dating. Züchner believe the two groups date from 23,000–24,000, and 10,000–18,000 years ago. Pettitt and Bahn believe the dating is inconsistent. They say the people at that periods of time painted things differently. They also do not know where the charcoal used to paint some things is from, and how big the painted area is. People from the Palaeolithic era drew well. They knew about perspective, and they knew of different ways to draw things. They also were able to observe the behaviour of animals they painted. Some of the paintings show how the painted animals behaved. The paintings may have been important for rituals. ↑ Trinkaus, Erik (2003). Early modern human cranial remains from the Pestera cu Oase, Romania (45 ed.). Journal of Human Evolution. pp. 255–259. ↑ 5.0 5.1 "'Oldest sculpture' found in Morocco". BBC News online. 23 May 2003. ↑ Alexander Marshack (1997). "The Berekhat Ram figurine: a late Acheulian carving from the Middle East" (pdf). ↑ 7.0 7.1 Klein, Richard G. 2009. The human career: human biological and cultural origins. 3rd ed, Chicago. ↑ Quotes from Clottes 2003b p214. ↑ Archaeologists sometimes use the phrase "B.P." (before the present day) to mean "years ago"
↑ Clottes 2003b p33. The oldest is sample Gifa 99776 from "zone 10". See also Chauvet (1996 p131, for a chronology of dates from various caves. Bahn's foreword and Clottes' epilogue to Chauvet 1996 discuss dating. ↑ Züchner, Christian (September 1998). "Grotte Chauvet Archaeologically Dated". Communication at the International Rock Art Congress IRAC ´98. Retrieved 2007-12-23. Clottes (2003b), pp. 213-214, has a response by Clottes. ↑ Pettitt, Paul; Paul Bahn (March 2003). "Current problems in dating Palaeolithic cave art: Candamo and Chauvet". Antiquity 77 (295): 134–141. http://www.antiquity.ac.uk/ant/077/Ant0770134.htm. This page was last changed on 21 March 2013, at 18:56.